Sometimes you have to drive five or six hours to the Upper Peninsula to find enough snow to justify stepping into your Nordic skis. And sometimes Heikki Lunta is smiling down on you and all you have to do is drive an hour or two to find well-set tracks. If the Yopper snow god is smiling, then head to Cadillac Pathway. This 11.5-mile network of six loops is neither the most scenic trail in Michigan nor the most challenging. It doesn't even have a skating lane. But for classic skiers, especially those on the western side of the state, it's often the quickest destination to the first ski of the season. 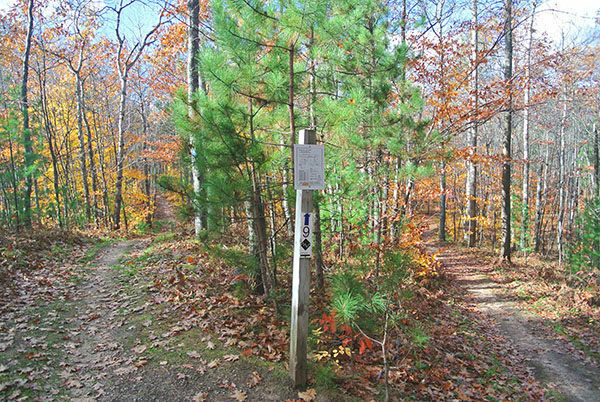 The pathway is on the edge of Cadillac, less than two miles from US-131, yet part of the Pere Marquette State Forest. You're in the middle of the woods, watching a deer scamper through the trees but only a five-minute drive from nutritionally rebounding at the fast food restaurant of your choice. And the pathway is guaranteed to be well groomed. 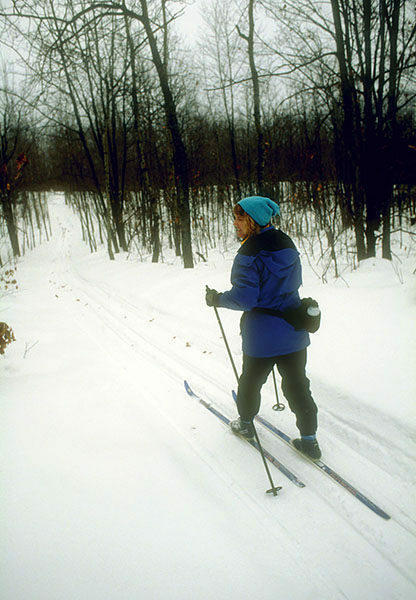 In 2010, when the Department of Natural Resources was slashing funds from its Nordic ski budget, locals formed the Friends of Cadillac Pathway. It was the “Friends” who raised the money that allowed the DNR to continue setting track at their beloved trail system that winter. The Friends have been grooming their ski area ever since. But the pathway’s most important attribute is its elevation. Located just 14 miles southeast of the highest point in the Lower Peninsula - Briar Hill at 1706 feet – Cadillac Pathway is a high, rolling ridge that runs from east to west. The pathway tops 1,400 feet five times and the segment from post No. 4 to post No. 8 is a mile-long climb of almost 130 feet. That gives the pathway a lofty status in the Lower Peninsula. The trail’s higher overall elevation not only equates to a hilly ski with lots of thrills, and for many of us a few spills, it’s the reason Cadillac Pathway is the southernmost groomed state pathway in Michigan. In short, there is more snow here early in the season that stays around longer at the end. Cadillac Pathway is basically a figure eight that is accessed from two trailheads at each end and in the middle crosses Seeley Road. The east end, occasionally referred to as Deer Loop for the numerous whitetails that winter there, offers the easiest skiing with loops of 1.3, 2 and 3.5 miles. The west end provides access to the most challenging terrain with loops of 2.25 and 4.85 miles. The perimeter of the entire system from the east trailhead is a 9.5 loop. Post No. 8, located near the pathway’s high point of 1,467 feet, marks the intersection where the loops from the east end of the system meet those from the west, making it a natural place to turn around and head back. No matter what direction you come from, it’s a long climb to the post, the reason somebody has thoughtfully put a bench there. 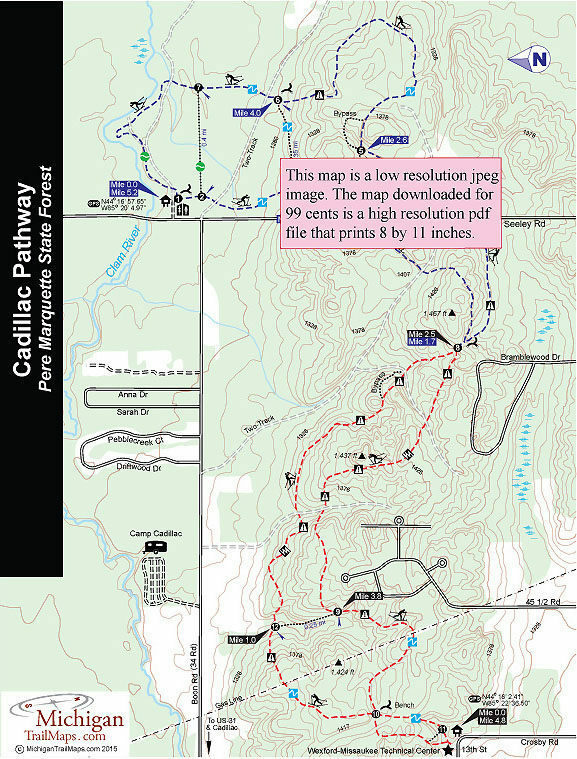 Cadillac Pathway is skied in a counter clockwise direction from either trailhead. Post No. 8 is a 5.2-mile outing from the Boon Road trailhead that includes three crossover spurs for shorter loops of 1.3, 2 and 3.5 miles. You warm up on level terrain to Post No. 3, reached at Mile 0.5 and then begin the first climb of the day. The ascent tops off at post No. 4 and from there the trail to post No. 8. quickly crosses Seeley Road embarks on the longest climb of the loop. 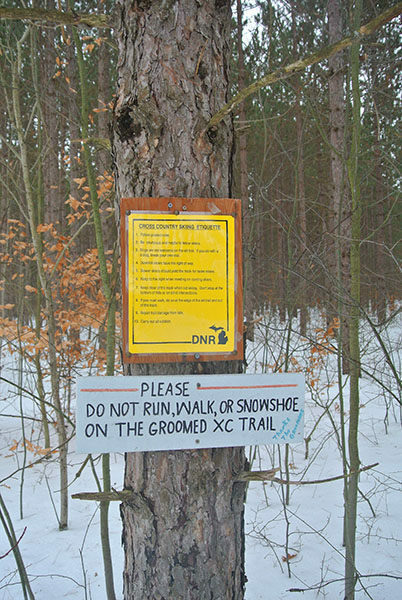 Within a quarter mile a two-track is crossed – be careful this is a snowmobile trail in the winter! – and the climbing resumes, more steeply this time, before reaching the high point of the day at 1,446 feet. You arrive at post No. 8 at Mile 1.7 where nearby is a bench for a well-earned breather near the crest of the ridge. The return to Boon Road begins with a long downhill run towards post No. 5, with paved Seeley Road occasionally popping into view. The snowmobile two-track and Seeley Road are crossed and then the trail climbs to post No. 5, reached at Mile 2.6. There's more climbing beyond the post but a bypass, often marked as a single track alternative for mountain bikers, allows you to skip the steepest section. 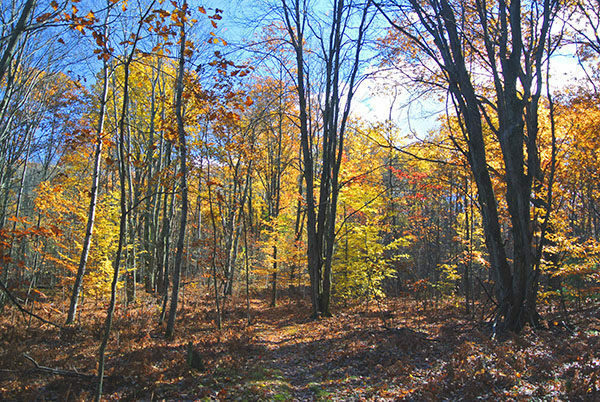 A gentle downhill follows through a second growth forest and levels out in a more mature stand of hardwoods where a handful of stumps leftover from the logging era can be seen. The trail then makes a quick descent off the ridge and bottoms out, reaching post No. 7 at Mile 4.4. The final leg back to the Boon Road trailhead is a level ski that quickly crosses a two-track and then swings west to follow a low ridge along scenic Clam River. You get an occasional glimpse of the trout stream before the trail arrives at the spot overlooking it at Mile 4.9. At this point, keep an eye out for the blue DNR pathway triangles and within a third of a mile you’ll pop out of the woods at the trailhead. The western portion of the pathway is accessed from the parking lot of the Wexford-Missaukee Career Technical Center and completely different in character from the East Loops. The first is a rolling ski of 2.25 miles; the second is a 4.8-mile run and includes the steepest hills of the pathway, steep enough so this stretch is the only segment posted with black diamonds. From a wooden stairway leads a trail on the far right, appearing like an old two-track that it probably was at one time, and quickly leads to post No. 11. The trail gently climbs, reaching post No. 10 and a bench within a third of a mile. Head left to ski the loop in a counter clockwise direction. After crossing a gas line corridor, you enjoy a long downhill run that bottoms out at post No. 12 at Mile 1, marking the return from the first loop. Head east (left) for post No. 8 and the “Most Difficult” rated stretches of the pathway. A long climb pass views of a farm to the north is followed by a sharp downhill to an old two-track at Mile 1.4. Another climb and then two steep downhill segments – the second featuring a bypass – is encountered before you make the final long climb to post No. 8, reached at Mile 2.5. The segment to post No. 9 – the return to the 13th Street Trailhead – is also a black diamond that begins with a steep downhill. Two descents later you bottom out at a two-track. Take a moment to catch your breath; a long climb awaits you on the other side. You top off at 1,417 feet and then descend to post No. 9 at Mile 3.8. Head south (right) to return to the trailhead. After re-crossing the gas line corridor, you enjoy a long downhill run to return to post No. 10. The final third of a mile of the loop can be slightly confusing in the summer and fall as there are several trails in the area. In the winter, however, you simply follow the groomed tracks. At the Boon Road trailhead there is a large parking area, a vault toilet and trail map. There are no facilities at the west trailhead at Wexford-Missaukee Career Technical Center. Boon Road trailhead. There is also donation canister for the grooming of the trails during the winter. Please give. 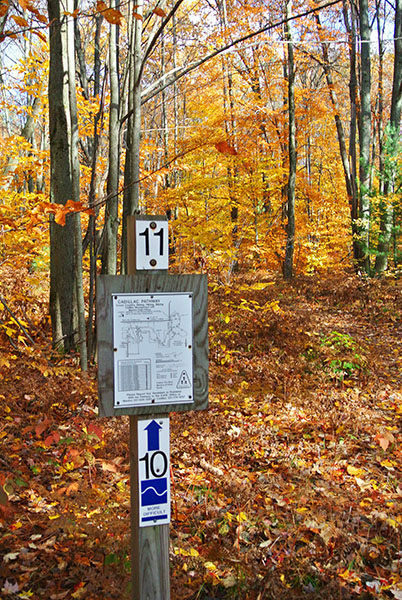 Two trailheads provide access to Cadillac Pathway. The main trailhead is at the east end of the system, at the corner of Boon and Seeley Roads, 3.5 miles east after departing from US-131 at exit 183. The west trailhead is reached by turning east onto 13th Street along Business US-131 in Cadillac and following it for 1.5 miles to Wexford-Missaukee Career Technical Center. At the back of the school, near the maintenance garage is a wooden stairway that leads to the trail. For the most current information about the Cadillac Pathway and snow conditions go to the Friends of Cadillac Pathway Facebook page. Additional information about the pathway is available from the Cadillac DNR Field Office at (231) 775-9727.